Quietly standing in the center of the hot springs town. Ichi no Yu and Yanagi Yu public hot springs can be found near by. An easy starting point for touring around to all of the outdoor public hot spring baths. Feel free to relax your tired feet in the small, shallow hot spring just for feet in front of Yanagi Yu. (Yanagi Yu is closed on Thursdays. )Wi-fi available. Plan with one night lodging and two meals included. Meals Dinner: A full course with snow crab. 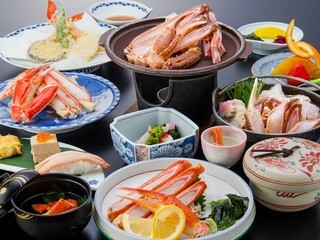 BreakfastThis plan features several crab dishes such as crab sashimi, boiled crab, grilled crab and more. : Tradtional Japanese breakfast. All meals will be served in the restaurant. Checkin: 15:00-18:00:The season in which matsuba-gani (snow crab) can be caught is limited to between November 6th and March 20th. During this season, crab lovers from all over come to Kinosaki Onsen in search of the perfect crab dish. Kinosaki is also called ‘Crab Kingdom’, because it is a place where you can partake of fresh crab that comes directly from one of the many ports located on the outskirts of the town. Guests with a meal plan will be served meals in the restaurant. Guests must check in by 6:00 PM to eat dinner at this property. Guests who check in after this time may not be served dinner, and no refund will be given. Full reservation cancellations and cancellations for single people in the group have a cancellation fee. Please notify us of any cancellations as soon as possible. *No pets allowed, no outside food or drink allowed.